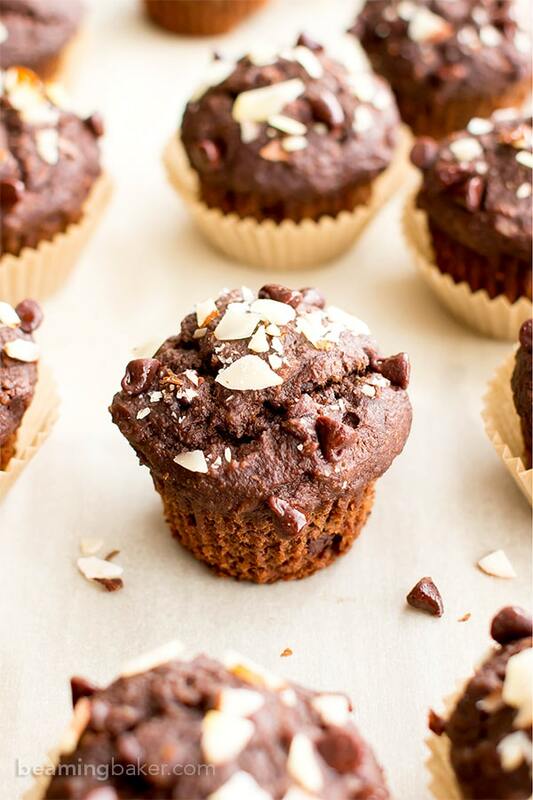 Double Chocolate Banana Almond Mini Muffins (V, GF, DF): a one bowl recipe for perfectly moist chocolate banana mini muffins made with oat flour and almonds. Vegan, Gluten Free, Dairy-Free, Oat Flour, Whole Grain. Guess what? My sister just got me a mini muffin pan!! How cool is that?? Oh okay, truth time: she didn’t just get it for me. She actually got it for me… um, let’s see… yep, back in August. Of last year. Oh, that just two seconds ago. Times 7,776,000. Okay, wow. 6 months have just flown right on by, as my precious “new” mini muffin pan got overlooked, stacked into the corner and wedged into the furthest, dustiest edges of my mind. I had so many grand plans for this miniature pan—homemade donut holes, mini pb cups, more homemade doughnut holes (totally a different recipe since the spelling is different, obviously), mini vegan chocolate cheesecakes, oversized nonpareils and so much more. Maybe I even had delightfully small, but still grand, plans for miniature banana muffins. <– Well, it’s good to know that I actually ticked one item off that list. I wistfully look back at 6 Months Ago me and see so many mini awesome plans in my future. But that was then and this is now. We’ve got plenty of full-sized treats on the blog (muffins, granola bars, cookies, and more), so now we can really play around with all the fun that comes from smaller versions of everything! Are you guys feeling a theme coming on? What would you say if I made mini versions of everything on the blog? 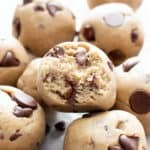 We could have mini double chocolate chip cookies, mini banana oat muffins, mini almond joys, mini peanut butter banana ice cream smoothies… oh wait… would that just be the same recipe poured into like 20 tiny cups? 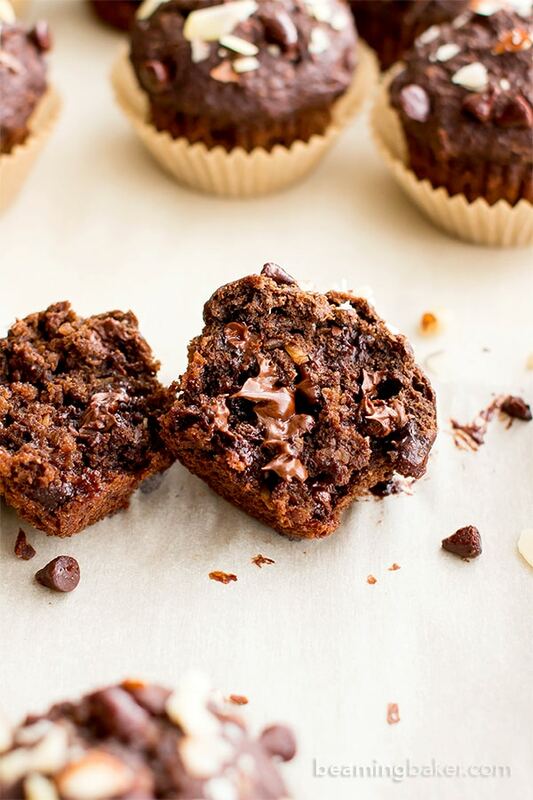 We could even make these peanut butter chocolate banana bread muffins from A Mind “Full” Mom in delish mini form! What recipe would you mini-fy on the blog? Alright, alright, that could take ages… and perhaps y’all don’t fancy smaller versions of everything. But I’ve got to say, something about smaller (and larger) versions of things makes them more fun, don’t you think? But, people kept asking me about how to reduce the sugar content. Darn it! As always, I wanted to give a thoroughly researched and thoroughly tested answer. But I couldn’t. I didn’t yet have the time to test and re-test versions of the double chocolate banana muffin with less sugar. So there it went, into the dusty, never-looked at corner of my mind (and my apartment). Until one day, a mere 182 days later… I saw the most perfectly spotted, deliciously ripened, golden bananas sitting on my counter. There may or may not have been a glowing spotlight that appeared above the bananas, pointing me to my next mission. So I scooted myself right on over and did what I had to do: sat down and had a nice long chat about GRDB’s (Gorgeously Ripened Delicious Banana) future. Would they go to college and aspire to be vegan chocolate banana bread one day? How about heading off to my mom’s and planning for a short, but sweet tenure as banana streusel bars? Or bundling up and preparing for a frosty, but purpose-driven stay in the freezer before they became strawberry peanut butter smoothies? Just as I was reaching over my stack of cooling racks and about to grab a loaf pan, I heard a whisper from… my mini muffin pan!! Apparently, now was the time stop my banana bread foolishness and get going on my long-awaited mission of making something that was both deliciously miniature and lower in sugar. And guess what? The results were amazing. I’m pleased to report that 1) procrastination is still a terrible idea; 2) domed tops are just as amazing if not more amazing on mini muffins; 3) double chocolate anything (unlike procrastination) is always a great idea; 4) less sugar totally doesn’t have to taste like it; 5) I really have to get moving on my other miniature plans…; and 6) I get really hungry when I have to think this much. So there you have it. Just a short period after receiving my graciously gifted mini muffin pan, I have expediently made my Double Chocolate Banana Almond Mini Muffins. Monica, are you pleased? Aren’t you so happy I didn’t try your patience by making you wait a full year to see me use this gift? Aren’t I the bestest sister ever? 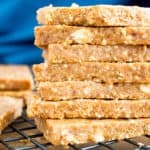 Next up on my list of baked banana treats is this wonderful Gluten Free Banana Bread from Gluten Free on a Shoestring! It looks fantastic, and can be made vegan by using flax eggs, vegan butter and dairy-free sour cream. So what do you think? Are you totally judging me harshly for waiting so long to use my gift? I know… me too. 🙁 But it’s time to cheer up and hit the kitchen together. 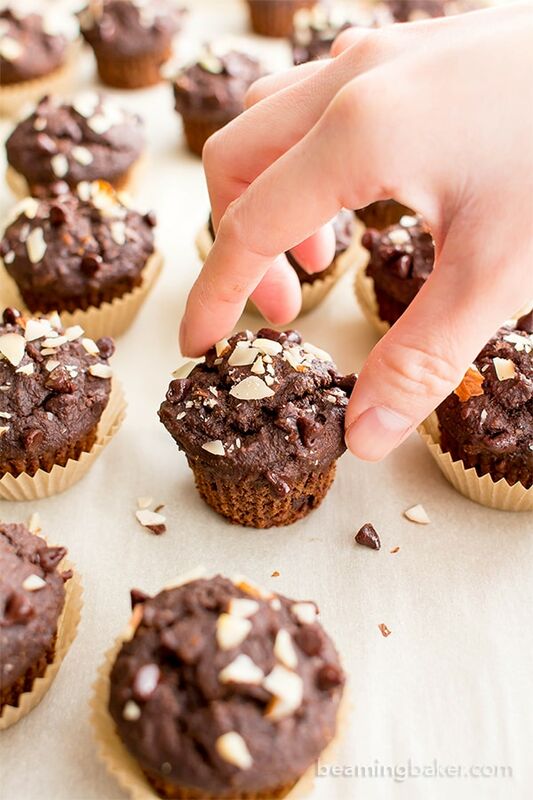 After all, these Double Chocolate Banana Almond Mini Muffins aren’t gonna make themselves (although we totally wish they would). 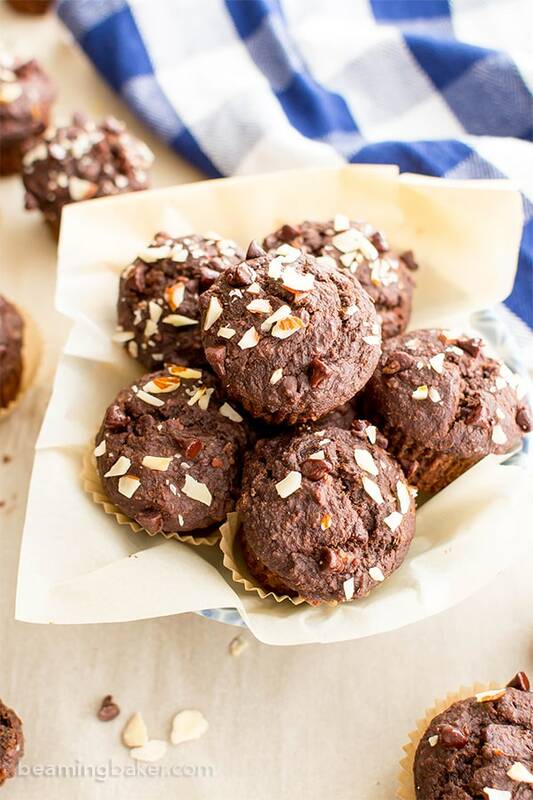 I’m also totally eyeing these chocolate almond butter muffins from Meaningful Eats! We can swap the eggs for flax eggs and voila! Vegan YUM. What’s your favorite mini version of any food (or other things… I’m now incredibly curious!!) to make? Or, if you could have me miniaturize anything on this blog, what would it be? Recipe-wise, of course, because I do not yet have access to Honey, I Shrunk the Kids technology. Darn it! 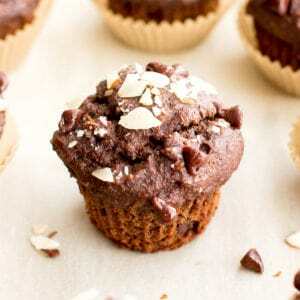 Double Chocolate Banana Almond Mini Muffins (V, GF, DF): a one bowl recipe for perfectly moist chocolate banana mini muffins made with oat flour and almonds. Vegan, Gluten Free, Dairy-Free, Whole Grain. Preheat the oven to 350°F. Line a 24-cup mini muffin pan with mini muffin liners. Add peeled bananas to a large mixing bowl. Using a sturdy whisk or fork, mash bananas until smooth. Add coconut oil, maple syrup, flax egg, and vanilla. Whisk until well incorporated. 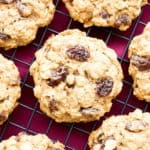 Add the dry ingredients: oat flour, almond meal, cocoa powder, baking powder, and baking soda. Whisk together until just incorporated, making sure no flour patches remain. Using a spoon or cookie scoop, drop batter evenly into muffin cups (about 2 tablespoons of batter per muffin). 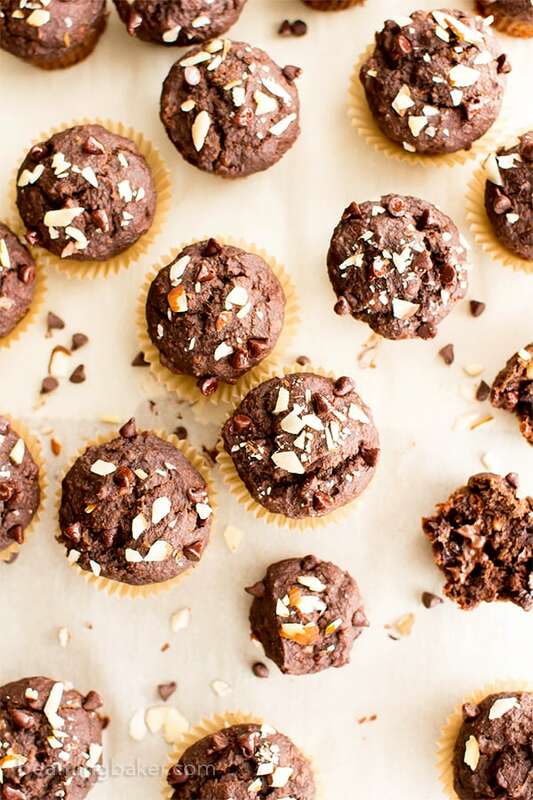 Optional: sprinkle chocolate chips and almonds on top of the muffins. Bake for 16-24 minutes. Mine took 19 minutes. Allow to cool on a cooling rack for about 1 hour. Lift out and enjoy! - Adapted from my Vegan Double Chocolate Banana Muffins and my Vegan Chocolate Banana Nut Bread. - *About 1 cup + 2 tablespoons, mashed. - These muffins freeze well. Store in an airtight, freezer-friendly container for 1-2 months. Allow to thaw at room temperature for about 15 minutes before enjoying. Or, heat in 20-second increments until warm. 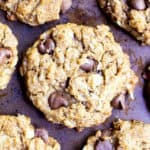 - More muffins + quick bread recipes: chocolate chip pumpkin muffins, gluten free banana oat muffins, gluten free vegan pumpkin bread. 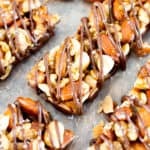 - More delicious chocolate recipes: best vegan brownies, chocolate chip almond butter walnut cookies, gluten free vegan brownies. Mini muffin pans are the best! I’ve had mine for the past 5 or 6 years, and although I don’t use it too often, I do love it. I just got a mini cheesecake pan (my mind is blown that they actually make those, I was just using my mini muffin tins!) the other day and can’t wait to test that out, too! I love mini-fying just about EVERYTHING, because mini foods are just too cute. 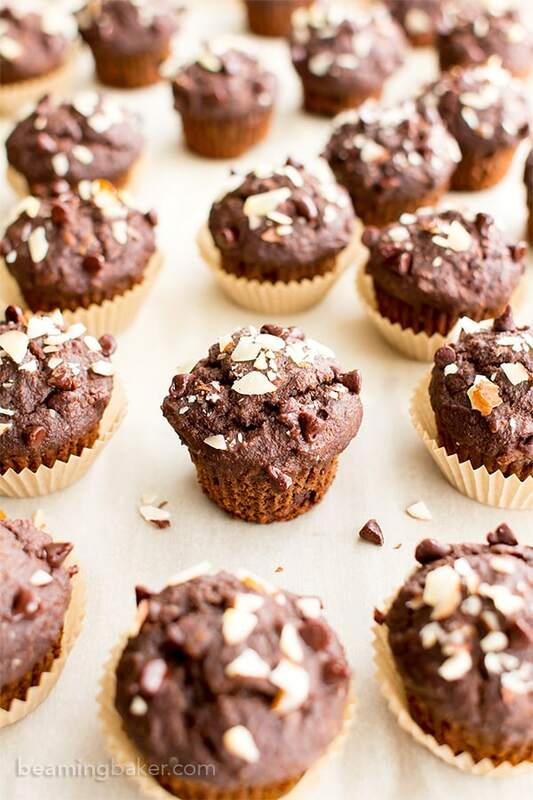 And these mini muffins…wowsers, they look SO good, Demeter! I love the chocolate, banana and almond combo. Or should I say double chocolate…YUM! What a perfect breakfast or snack, and the best way to start out Monday! Pinned of course! Hope your week is off to a great start! There’s something so much fun about them! 🙂 Oh goodness with the mini cheesecake pans! They must be the cutest things ever! 🙂 Mini foods are seriously the cutest. Thanks Gayle! Happy Monday! 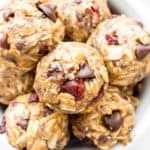 Haha – I say go right ahead and mini-fy those double chocolate chip cookies, banana oat muffins, and almond joys… maybe even those peanut butter banana ice cream smoothies – cos a mini smoothie is simply too fun – right?! 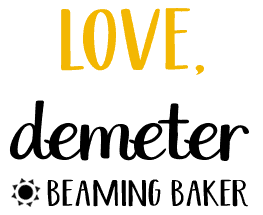 Demeter, your story about your muffins pan reminds me of mine with my slow cooker – only – it was almost a year before I remembered mine! 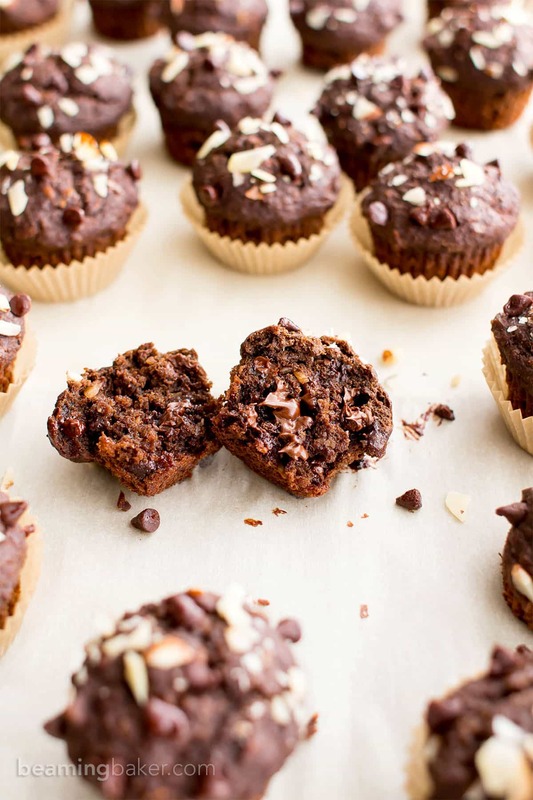 Speaking of these muffins – I love your use of banana in them to lower the sugar content. 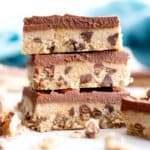 Ever since last summer when I stumbled on quite a few articles about how sugar was worse off than fat was, I’ve been doing my best to watch my intake of it and am over the moon with this recipe! Besides, banana+chocolate=a match made in heaven! Happy Monday to ya! My family loves mini everything as do I. I’m always amazed by how you make the best looking, simple to put together, healthy goodies. Sorry, that was a mouthful but you know what I mean. You got mad skills girl! Demeter I love mini muffins!! I can eat 2 but still feel good about myself 🙂 hehe I love chocolate almond version going on here!! So need to make these now!! Yay!!! They’re something that’s just so fun about them, right? 😉 Hey, you can eat three if ya want! 🙂 Can’t wait to hear what you think. Thanks, Ami! My kids and I adore the original recipes and I’m super excited to try the mini version. However, I’m always playing with great recipes and my go-to version uses 4 bananas instead of any sweetener and carob in place of cocoa powder. Thanks for all of your hard work creating yummy recipes! 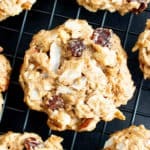 Can I substitute the flax egg with a real one? You mean 2 teaspoons, I think. Two T would never fit in my mini-muffin tins. I like the recipe, though. I’d like to try them full-size as well. Thanks for posting. Nope, I mean 2 tablespoons. I used my 2 tablespoon scoop when scooping the batter. Perhaps you used a different mini muffin pan? Here’s the one I used (aff): http://amzn.to/2uX17bo Enjoy! I have a mini muffin pan too, and it also was a gift. I love it! I love using it for cupcakes cause it’s perfect for tiny hands. I remember when my daughter graduated kindergarten I made the cutest confetti cake cupcakes. It was perfect for kindergarteners, way less mess! I also like using the pan to cook meatballs. However, the clean up isn’t easy if you don’t use liners. Have you found that too? Your recipe sounds delicious ???? I love the domed tops! I just made banana mini muffins with all almond flour and I was so disappointed that they sunk in the middle. Any tips? 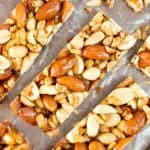 Should o not use all almond flour? 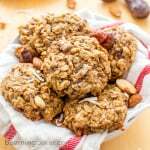 I’ve been experimenting a lot with it lately but I have found the most success when mixing it with oats. Can we substitute applesauce for the bananas? Or any other substitute suggestions? Could I leave out the coconut oil? Hi Avalon! That would change the texture and consistency of the muffins quite a bit. I have had some readers sub the oil with apple sauce to good results. Hope this helps!